Traditional lehengas and sarees have already played a lot in the playground of fashion. Have seen the craze and beauty of lehenga sarees? If you haven’t yet, you have landed at the correct place where you can know more about the exquisiteness of beautiful lehenga sarees. 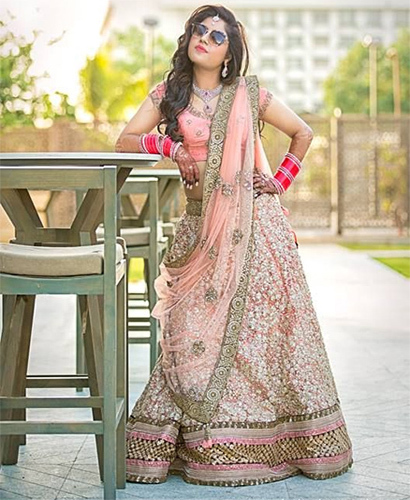 Traditionally, lehenga or lehenga sarees are the embraces by North Indian women but nowadays, it has attracted a heavy mass around the various regions of India. Not only brides but bridesmaids or aunts or kids do also have the opportunity to enjoy the beauty of Indian traditional dresses. If you talk about the bridal couture, of course, the lehengas and sarees will be the showstopper of the show. Thanks to our vehement trail of fashion designers, who have to maximise the bar of expectations in the designs of lehenga sarees and undoubtedly every time, they are bringing up something new and satiating to the eyes. From cape sleeves to layered lehenga sarees, we have a basket full of designs and styles. So, are you ready to check out some of the hottest lehenga saree designs to steal this night? Lehenga saree is the darling of every woman and she actually doesn’t need anything to cover up or complement that look. She can simply do it with a 1000Watt smile, wearing a single shaded lehenga saree! These sarees carry single toned colour or hue and don’t impose many designs as compared to others. They are light in weight and easy to carry, therefore. If you desire to put some more colours and fun than the previous one, choose dual tone lehenga sarees for the next special event. These sarees come in contrasting colours or same colours with different shades to make the wearer look more attractive. These sarees usually come with broad border work and pallu work. They are such gorgeous pieces to embrace during special occasions that even a string of silver will be enough to complement your look. Spiff up your look with this dull gold work lehenga saree which has complete patchwork over it and broad golden work at the border. This saree has a beautiful net pallu which is surely steal-worthy. Buy this type with the same colour and design pattern and complement it with pearl jewellery set. Choose the colour according to the season of the year; for instance, you can choose pastel or coral colour palettes during summer and something bright during winters. They are light in weight but very delicate to carry. Take precaution while embracing it and do not forget to wear proper makeup to spiff up the complete look. Layered style lehenga sarees are made to make you look outstanding even in the crowd of models. The double or triple ruffle like layers on the lehenga skirt will make the wearer look tall and slender. Wear them with choker gold necklace and embellished pumps.